Citation: Moguel R, Samaniego V, Vela A. Catheter based treatment of the chronic cerebrospinal insufficiency in patients with multiple sclerosis, a single center experience. J Biomed Imag Bioeng 2018;2(2):95-98. Multiple sclerosis is a chronic neurological disease that expresses clinically in many different ways and causes varying degrees of disability in young and mature people who may reach advanced ages in complete dependence and severe quality of life impairment [1,2]. This disease has been addressed for years under the concept that it is the result of an autoimmune disorder that causes demyelination in both genders but predominantly in women, with multifactorial etiology involving genetic and environmental factors and three basic forms of behavior [3-5]. Relapsing-remitting, in which patients have an initial attack with full or partial recovery followed by relapse with full or partial recoveries without significant progressive neurological deterioration. Secondary progressive, in which patients who start as relapsing-remitting form later miss recovery and suffer increasing neurological impairment. Primary progressive, in which patients do not recover from the first attack that leads to advanced states of disability. Dr. Charcot, considered the father of Neurology and the German pathologist Eduard von Rindfleisch, first described this condition in the nineteenth century and both agreed on the possibility of vascular connection, due to the constant presence of blood vessels in the center of the histopathological lesions [6,7]. Several researchers have emphasized the vascular genesis of multiple sclerosis, based precisely on this evidence and in summary, the histopathological lesion is composed of vascular blood elements surrounding a vascular area; these elements include iron and blood cells that may evidence the blood-brain barrier [8,9]. During the decade of the thirties, the neurologist Tracy Jackson Putnam was president of the medical advisory board of the United States for the National Multiple Sclerosis Society and performed an experimental obstruction of cerebral venous outflow in dogs followed by observation of brain plaques similar to those that develop in humans with multiple sclerosis. Dr. Putnam concluded its work with the remark - The similarity between these lesions (in dogs) and many of those seen in cases of multiple sclerosis in humans is so striking that the conclusion seems almost inevitable that venular obstruction is the immediate background essential for the formation of typical sclerotic plaques - Unfortunately these fundamental observations never influenced the neurologists and Dr. Putnam is absent in the history of the National Multiple Sclerosis Society of the United States . At the end of the last decade, the vascular surgeon Paolo Zamboni, from the Vascular Diseases Center, University of Ferrara (Italy), published an original paper describing the findings of brain venous flow in patients with multiple sclerosis . He studied the vein flow by ultrasound and invasive angiography and found abnormalities by obstructions of the internal jugulars and azygous veins, which are the veins that collect the flow from all the structures of the central nervous system. The causes of these obstructions are unknown but the study disclosed that the patterns of obstruction vary and express as valve stenosis, tubular obstruction of proximal segment of the internal jugulars, internal membranes and deflections of veins, with evident collateral circulation and slow flow. In such publication, sixty-five patients with multiple sclerosis of the three types, were included and treated with balloon angioplasty in stenosis of the internal jugular and azygos veins. It showed a reduction in disease progression on counting MRI lesions and improved functional status and quality of life, particularly in patients with the relapsing-remitting form of multiple sclerosis. The originally described technique has undergone several modifications, mainly because Dr. Zamboni utilized compliant balloons that later showed limited efficacy and greater likelihood of injury to the vein wall. After this publication, many centers started their own experience that included variations between different operators and service centers, with varying predilection for stenting in some centers, as well as preliminary tests for neurological assessment, which included pre and post-procedure, ultrasound and magnetic resonance venography; all this information is present in social media by operators and patients. Choice the right femoral vein whenever possible, because the easier manipulation of catheters due to minimal angulation relative to the vena cava, sufficient local anesthetic should be injected and insert a 10 or 11F introducer. The venipuncture may be difficult in patients with spastic movements of the legs or the entire body and more difficult in patients who are in chronic constant forced flexion of the hip due to continuous spasm. Sometimes it can be helpful to use the arm veins for the diagnosis or to place a guide in the femoral vein in order to help the puncture with fluoroscopic guidance. The catheter should end on a smooth curve for the selective cannulation of both internal jugulars and azygos. In the experience of The Clinics of the Heart, we have preferred the Radial catheter (Boston Scientific) because it provides a great efficiency in selective take of the azygos plus good navigation into the left innominate artery and the ipsilateral internal jugular vein. The right internal jugular can be selectively cannulated with any multipurpose or neurological catheter; the learning curve is not easy. It is wise to administer a low dose of intravenous heparin after the vein puncture and continually wash the sheath, especially before each catheter exchange, to prevent the introduction of thrombus into the visited veins. The main azygos vein is a large vein, about 10 mm in diameter, which is formed from the confluence of the azygos and hemiazygos; it drains directly into the superior vena cava, this vein can be cannulated easily with the tip of the catheter just above the right atrium by rotating the catheter slightly to the left in an antero-posterior position. It is preferable to do the angiography on a left anterior oblique position in a degree enough to expand the entire curve of the catheter. The contrast dye should be injected with the tip of the catheter just into the vein, to assess the good or slow return to the superior vena cava. The internal jugular veins should be treated with the same catheter or with an angled catheter and the help of a 0.035” Terumo wire with stiff curved tip and 260 cm long. Angiography should be done in antero-posterior and other projections may be choice if necessary, to improve the imaging; most of the obstructions are present in the lower segment but sometimes the obstruction is due to a twist in the middle or superior segments as well the entire vein. If the vein is sufficiently filled, collateral vessels may confirm the insufficiency. Very often, the valve is hypertrophic and redundant, making difficult the entrance of the catheter and the guide and force maneuvers to advance within the vein. It is confirmed that the guide is within the internal jugular vein when it is very straight and can easily move into the skull. 1. Improvement of the stenosis. 2. Increase of the flow rate. 4. Absence of dissection or thrombus. Sometimes the vein is very tough, especially the left jugular causing that the balloon does not lose its waist when inflated close to the burst pressure (not recommended burst pressure to avoid serious damage to the vein and cause thrombosis). In The Clinics of the Heart, we've used cutting balloon in some cases with very good results, followed by balloon dilatation at lower pressures than previously required. 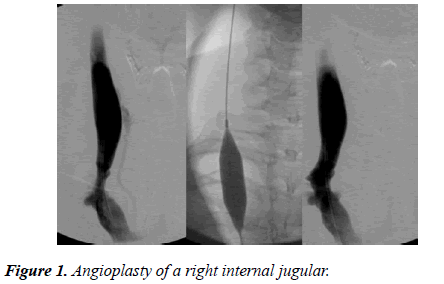 The Figure 1 shows the angioplasty of a right internal jugular; note the significant stenosis and the collateral vessel before treatment and the resolution of both conditions after. Figure 1: Angioplasty of a right internal jugular. The experience of The Clinics of the Heart started from a pilot group of ten patients who were invited using the social media; all of them had neurological improvement even before leaving catheterization suite, so an invitation was opened in the context of medical tourism with more than five hundred patients treated to date. The data from the first 390 patients are shown on this publication. The revised McDonald criteria confirmed multiple sclerosis in every patient. All the patients signed the informed consent form, endorsed by the ethics committee. All patients received basic laboratory, MRI and jugular ultrasound. All patients received neurological evaluation before and after treatment, based on the disability scale (SDSS: Expanded Disability Status Scale). This scale indicates disability status from 0 to 9, where 0 is no disability and 9 is for patients in prostration and total dependence on their caregivers. All patients received neurological evaluation before and after treatment, according to multiple sclerosis functional composite (MSFC: Multiple Sclerosis Functional Composite) consisting of several tests of mechanical skills. Both neurological evaluations are based on the methods described in the original paper from Paolo Zamboni . All patients received otoneurological review pre and post treatment. Statistical analysis was performed using t Student test for numerical variables and chi square for variables present or absent. The study included 390 patients from June/2010 through January/2011(51 ± 11 years old, male/women 31.6/68.4%), with an average diagnosis time of 17 years; the distribution according with the clinical type of MS was: Relapsingremitting 29.9%, primary progressive 24.1% and secondary progressive 46% as shown in Table 1. Table 1: The distribution according with the clinical type of MS. The vessels treated were left jugular in 93.5%, right jugular in 96.4% and azygous in 20.4% of the patients. There was noted clinical improvement in 91.2% of patients, with decrease on the EDSS scale (5.46 vs. 5.06) and increase on the MSFC scale (0.07 vs. 0.15). Sixty percent of the patients had instability before and only 2% after the treatment; hypoacusis 31.8% and 16.1% after and tinnitus was shown in 35% before and 5.5% after the treatment; all of these changes showed statistical significance (p<0.01) and were noted very early after the treatment, sometimes immediate in the catheterization suite or during the next 48 hours. Fourteen self expanding stents were implanted to improve results. Severe complications were found in 1.4% of the patients and included thrombosis of the treated veins, femoral artery pseudo-aneurysm and balloon rupture; none of them caused neurological worsening. Based on old publications and the histopathological characteristics, it is probable the vascular origin of multiple sclerosis, with evidence of vein congestion due to mechanical obstruction of the internal jugular and azygous veins; the recent demonstration of delayed flow in these veins supports this probability. The publication by Paolo Zamboni showed the improvement of the first ever patients treated by angioplasty as this experience shows, with minimal complication rate that may even decrease with the progress of the learning curve. This concept opens a new therapeutic approach for the patients with multiple sclerosis. We want to thank to every one of our patients and to all the team from The Clinics of the Heart for the precious time and expertise dedicated to this experience. Minagar A. Current and future therapies for multiple sclerosis. Scientifica. 2013. Noseworthy JH, Lucchinetti C, Rodriguez M, and Weinshenker BG. Multiple sclerosis. N Engl J Med. 2000;343:938-52. Disanto G, Morahan JM, Ramagopalan SV. Multiple sclerosis: Risk factors and their interactions. CNS Neurol Disord Drug Targets. 2012;11:545-55. Mowry EM. Natural history of multiple sclerosis: Early prognostic factors. Neurol Clin. 2011; 29:279-92. Vukusic S, Confavreux C. Natural history of multiple sclerosis: Risk factors and prognostic indicators. Curr Opin Neurol. 2007; 20: 269-74. Rindfleisch E. Histologisches Detail zu der grauen Degeneration von Gehirn und Rückenmark. Arch Pathol Anat Physiol. 1863;26:474-83. Charcot JM. Histology of "sclerose en plaque". Gazette Hosp. 1868; 41:554-66. Lassmann H, Suchanek G, Ozawa K. Histopathology and the blood?cerebrospinal fluid barrier in multiple sclerosis. Ann Neurol. 1994;36: S42-6. Craelius W, Migdal MW, Luessenhop CP, et al. Iron deposits surrounding multiple sclerosis plaques. Arch Pathol Lab ed. 1982;106:397-9. Putnam TJ. The pathogenesis of multiple sclerosis: A possible vascular factor. N Engl J Med 1933; 209:786-790. Zamboni P, Galeotti R, Menegatti E, et al. A prospective open-label study of endovascular treatment of chronic cerebrospinal venous Insufficiency. J Vasc Surg. 2009;50:1348-58.